Face/Reach: 30 ft. by 30 ft. / 15 ft. The ultralisk is a dreaded opponent indeed. The gargantuan creature stands on four massive legs and has a pair of blades, each nearly 15 feet long, set on either side of its jaw. After it lumbers into combat few things remain alive long. The ultralisk attacks with its powerful jaws inflicting 4d12+11 points of damage and the two blades on either side of its head, inflicting 6d8+11 points of damage. The blades are incredibly strong and sharp and cut through armor as easily as paper. Any attack made with the blades ignores, armor (both natural and regular) and shield bonuses. Rend Armor (Ex): The powerful blades that the ultralisk uses to attack with are so sharp that each strike has a chance to completely destroy any armor an opponent is wearing. Each attack forces a fort save (DC 10+damage inflicted) or any armor worn is destroyed. Magical armor receives a bonus based on the caster level of the armor. If the opponent has no armor but has DR or natural armor a fort saved is made based on the creatures fort save DC. Failue means they loose 1d2 points of NA or DR.
Vorpal Attack (Ex): The ultralisk's blades, on a successful critical (19/20), act as a vorpal sword, The creature then makes a Fort Save DC 30 or the opponents head is severed if the opponent is same size or one size smaller then the ultralsk or the opponent is sliced in half if Large or smaller. Fast Healing (Ex): An ultralisk heals damage extremely fast, recovering 10 hit points each round upon creep or 5 hit points off creep. Metabolic Burst (Ex): The ultralisk may, once each day, cause glands within its body to secrete a fluid which makes the creature move with much greater speed. The effect lasts for 10 rounds and during this time the ultralisk can move over the ground at double it's normal rate and enjoys all the effects of a haste spell. As a full-round action, the ultralisk can attempt to overrun any creature that is at least one size category Smaller than itself. This works just like the overrun combat maneuver, but the trampling creature does not need to make a check, it merely has to move over opponents in its path. Targets of a trample take an amount of damage equal to 10d8 +16. Targets of a trample can make an attack of opportunity, but at a –4 penalty. If targets forgo an attack of opportunity, they can attempt to avoid the trampling creature and receive a Reflex save to take half damage. The save DC against an ultralisk’s trample attack is DC28. A trampling creature can only deal trampling damage to each target once per round, no matter how many times its movement takes it over a target creature. Roar (Su): An ultralisk can unleash a devastating roar every 1d4 rounds as a standard action. All creatures except zerg within 120 feet must succeed at a DC 21 Fortitude save or become Shaken. Those within 30 feet who fail their saves are also deafened for 2d4 rounds. This is a sonic effect. The ultralisk can lower all its blades and charge a creature its own size or one size lower. WHen using a powerful charge and attacking with all blades the ultralisk does a gore attack for 10d8+6 dmg. Darkvision: Zerg have darkvision 60 ft.
Metabolic Healing: Fast Healing5, on creep Fast Healing 10. Hive Mind: All zerg of a swarm share a consciousness, called a hive mind. This allows other members of the swarm to be aware of what transpires to any other member of the swarm regardless of distance or barriers between them. Only the greater zerg have a consciousness of their own, with the lesser members of the swarm acting by instinct, impulse or the directives of their masters. This hive mind makes them incredibly difficult to influence with mind-influencing spells or powers granting all zerg a +10 circumstance bonus on Will saves to resist mental effects of any kind, furthermore they gain a +2 on all Perception checks for every other zerg within 60 ft. of them and finally anyone who attempts to breach the zerg's hive mind (through magic or psionics) risks becoming insane Will Save DC 28 (as Confusion CL20). Immunities: The zerg's incredibly fast metabolism causes all poisons and diseases to be burned from their system before they can cause harm. 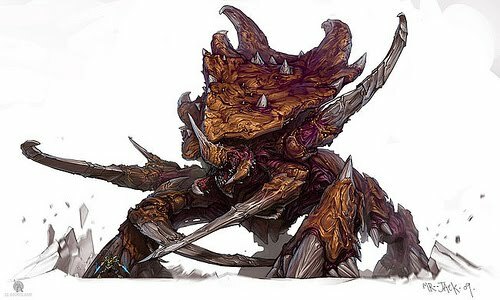 Resistances: Zerg are incredibly hardy creatures that can persist, and flourish, in nearly any environment. They have acid, cold, and fire resistance 20.